Here are two really small Windows tools some might find useful for their PS3 covers. 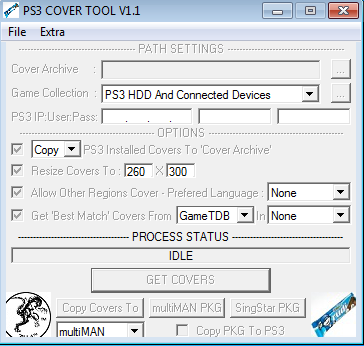 Includes "PS3 COVER FILTER" and "JPG BATCH RESIZER". - Added game search at 'PS3 and connected devices' without the help of 'NetDrive'. Following the initial news and follow-up, today PlayStation 4 developer CTurt confirmed news of a PS4 Kernel Exploit via Twitter! While this is fan-freaking-tastic news, keep in mind this does not mean there is a PS4 jailbreak... yet. TrueAncestor PS3 PKG Repacker for Windows command prompt. Following the recent news of Naughty Dog disabling PS4 Uncharted 4 Multiplayer Beta game sharing, PlayStation 4 modders Xmax Katsu / EuroAli103 have released an Uncharted 4 Beta Unlock proxy application which allows users to download and install the Beta. However, according to reports the Uncharted 4 PS4 Beta won't actually run unless you have a savegame of the Uncharted Nathan Drake Collection on your PlayStation 4 console itself.